For more than half of my life, I have dug bottles. I began at the age of 15, being shown the great hobby of dump digging by my grandmother, who took me digging. She owned an antique shop in the Pocono Mountains of Pennsylvania, and was interested in old glass. I guess I kind of inherited my love of old glass. I dug in dumps for years. Privy digging became my passion about six years ago, and my digging buddy and coworker, Paul Sidel, and I have been seeking out old privies (1840s-1870s, preferably) and have had some wonderful success the last year in particular. This story is about a special find and what I can only say is a once-in-a-lifetime thrill. I doubt I will ever find another bottle to compare to this one. The bottle gods must have been shining on us that day! Summer was here, and it was hot, but never too hot to find a good privy and dig. At the first outing, we didn't find anything, which panned out to be a privy pit. We did see an old house, which had a plaque saying 1850 on the front, and thought that it looked like a possibility. It was empty and had a "for sale" sign in the front yard. We went to the house next door and knocking on the door, we waited, but no one answered. We were just beginning to walk away, and a lady called us back. We explained to her our hobby and how we looked for old bottles from a hundred years ago or more. We waited for her answer and she gave us a "yes" in being able to do some checking and digging in her yard. It turned out that she was a local historian and writer, and knew quite a bit about the area. We told her we were "privy locators," but never used the word "dig." She laughed. We did some probing around her yard, but the first few times, we had no success. She told us that the house she lives in used to be one whole house, but in the 1870s, it was split and one side was where she lives presently and the other was apartments for rent. She said she hadn't thought much about it, but when we probed again and again, and came up with nothing, she remember that there had been a 20-foot brick well in the yard which had been filled in. That was when we thought to ourselves that privies were never near a water source, so we had probed for nothing. We didn't want to give up entirely, knowing this was an old house which had been next door because it had been one large house, built in the 1840s, later divided in the 1870s. We now needed permission from the owner whose land the privy was sitting on, but it was about a month later until we could get the OK to begin digging. We told her we would repair the sinking sidewalk for our being able to dig. In the end, we also unclogged the gutters! The date of our actual dig was Aug. 4, 2007, a Saturday. We began by first turning over the old Victorian slate sidewalk, which was sinking badly, and probed under it. We hit what seemed to be concrete, but as we dug down to it, it turned out to be old slate slabs, about four feet underneath the original sidewalk. Apparently they were used to cap off the pit. As we dug deeper, we began to find shards of glass, then a wood wall which turned out to be a big square woodliner, of about 7 by 4 by 5-feet deep. It seemed to have been dipped badly, as nothing was whole. All the shards we had found were from the 1870s period, some even had dates on them. We ended up hitting clay and figured we were done, and this pit had been cleaned out to the max. We probed one more time, and the probe went through the clay cap! It turned out to be a huge clay cap about six feet wide and four feet thick. What was going on here, I thought? We figured they had capped off their original privy from the 1840s and used the existing hole to build the 1870s privy, so this was likely the 1870s pit on top of an 1840s, '50s and '60s double privy. Once we discovered this was a big clay cap, we knew we just had to keep digging. It took a bit of time and work to get the cap removed and on the way down, we uncovered a nice, 10-sided iron-pontiled peppersauce. After some time, we saw the black use layer, and out popped an aqua summer/summer tree, which was bottom up in the clay cap, with the nose end in the soft use layer. This had protected it all these years! It was in the three-foot trash layer that we began finding pieces of Coffin and Hay flasks, Washington Taylor, Father of Our Country, Union clasped hands flasks in citron, one in sapphire blue, a few cobalt blue IP sodas, Jenny Linds, and two broken summer tree flasks, one in a dark teal colored glass. All were broken. What heartbreakers! Another heart sinker was a broken Turners Sarsaparilla, in the 12 by 7-inche size. Finding such great bottles, even damaged, was exciting. We dug on, with hope in our hearts, yet of finding some whole bottles in the pay dirt at the end. Paul was down in the pit, and after about half an hour of digging, he comes out of the pit with a whole Washington-Taylor Dyottville Glass Works flask and an eight-sided cobalt Seitz & Bros. iron-pontiled soda. Paul is done for a bit, and it's now my turn to go down into the pit. I started to scratch on the far wall, and with a few strokes of the digging tool, the glass began to fall out like crazy, and out came a cobalt porter beer. More shards fell, and I saw pottery pieces, flask pieces, pieces of bottles in various shapes and colors. I realized that the side I was digging on must have been the side that they tossed most of the trash down, and as I thought, this had to have been a double privy. All the glass seemed to be packed on the one side. As I kept digging, all I found were pieces, nothing whole. I could see the end was just about near, as I was beginning to see less and less pieces of glass. As I dug a little more, I could see the base of what looked to be a bottle, but was it whole? I held my breath and hoped it might be, as all I could see was the base. It wasn't pontiled. It looked amber in color, but I could not tell for certain. As I dug it out, I saw a raised up eagle, then some embossing. By this time, my heart was skipping beats! I could make out the embossed lettering said Dyottville Glass Works Philadelphia. I got out of the pit fast! Not sure what I had in my hands, but with a closer inspection of the bottle, I could see it was a light puce color, and in near mint condition as well! There were a couple of small flea bites on the shoulder, but that was all, and no other damage whatsoever! The flask turned out to be a GII-38, a very rare bottle indeed, in this color. The bottle is called a Flying Eagle with a Shield; I am not sure how many examples are out there, but that really doesn't matter to me, as this was a great dig as well as our having had a good time in doing the dig, which for me, is all that matters. Digging up history is what it's all about as well as enjoying the company of a good friend or two in doing so. It's funny how things work out sometimes. In a pit where there were so many broken historical flasks (about 14, I believe we counted, give or take) the best bottle was at the bottom of the pit and in near mint condition as well! I do have to conclude that the bottle god was looking over us that day and along the whole journey of our getting in to this yard to find and dig the privy. You never know, but we sure made out that day! Digs like this are what memories are made of! 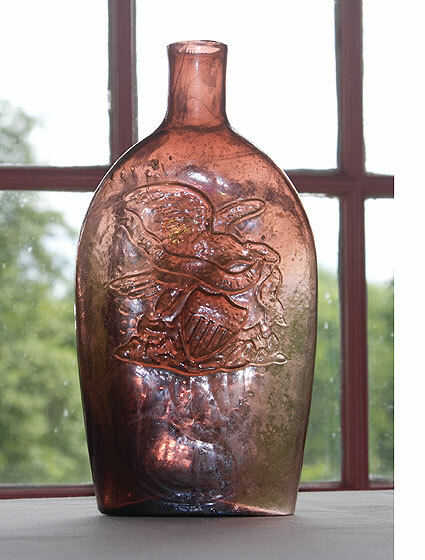 This bottle was offered in our Premier Auction 128, September 21-30, 2015.